DIVORCE ‘BLAME’ TO COME TO AN END? At the moment to obtain a Divorce, the Petitioner (person issuing the divorce) has to prove that there has been an irretrievable breakdown of the marriage evidenced upon the ‘fact’ of adultery, behaviour, 2 years separation with consent, 2 years desertion or 5 years separation with no consent. This has meant that anyone wanting to divorce their spouse sooner than 2 years has had to ‘blame’ the other party for the breakdown of the marriage. There have been calls for a number of years from many sources, including Resolution, to end the stigma of blaming each other (adultery / behaviour) to enable a Divorce to be obtained now rather than later instead of waiting the required 2 years. Therefore, the news that the Government is willing to end the ‘blame game’ is welcomed by our family law practitioners with open arms. This introduction of a “no fault” system is huge. It represents the biggest change in divorce law in 50 years. Irretrievable breakdown of a marriage will be remain as the sole ground for divorce. However, the requirement to provide evidence of a ‘fact’ in support of this will be replaced with a requirement to provide a more simple statement of irretrievable breakdown thus removing the concept of blame. Further, we understand that the government is proposing to remove the ability of one spouse to ‘contest or defend’ a divorce in court and there are even plans to look at both parties providing notice jointly of their intention to divorce. This will of course assist the parties to negotiate without the need for blaming each other and hopefully ensure that related children and financial issues following the parties’ separation can be less confrontational and stressful. Gillian & Kim are both members of Resolution and will always try to help couples deal with the consequences of relationship breakdown with as little acrimony as possible. We also offer initial FREE 30 minute appointments, payment plans and where possible ‘pay at the end schemes’. Contact us today on 01942 206060 to arrange an appointment. Are Millennials Refusing to Get Married? Over many decades, the allure of marriage has evolved from a share of labour, financial arrangement and the ultimate fairy-tale to show commitment. However, this trend appears to be shifting with more and more millennials either putting off marriage or not getting married at all. There are many reasons for this, perhaps due to the costs of a wedding for those who are opting instead to try to get on the property ladder or perhaps this is a total shift in culture and tradition for the upcoming generation. The most recent information from the Office of National Statistics tells us that the age of couples opting to marry continues to increase with the average age of women entering into marriage being between 35-37 years of age and for men between 37-40 years of age. However, with statistics telling us that 42% of marriages in England and Wales end in divorce, is cohabiting the way forward and are millennials right to put off this tradition of marriage? Studies tell us that marriage can offer a number of positives including tax benefits, improved economic security and health benefits (apparently the latter is especially relevant for men!). Financial security can also be offered in marriage and should the parties later divorce the Court will have to consider a number of factors to ensure that both parties are provided for, together with any dependent children, in an arrangement which is fair and reasonable to all. 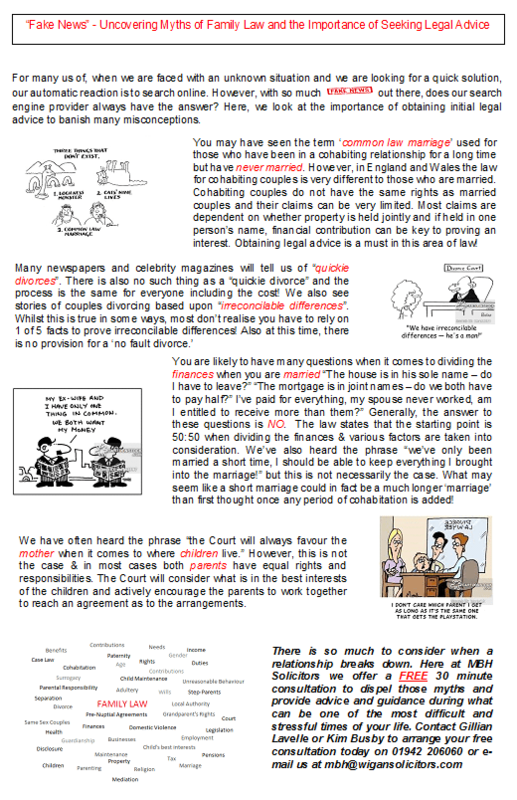 However, the same factors do not apply to cohabiting couples which can place couples who have been cohabiting for a long period of time in financial difficulty if their relationship breaks down (especially where one partner has never worked and has cared for the children and all assets are in their partner’s sole name). The government do appear to be taking into consideration the change in culture and an update is also awaited in relation to offering heterosexual couples the opportunity to enter into a Civil Partnership rather than marriage which offers a compromise to those who wish to have the security of marriage without engaging in the tradition of a wedding ceremony. But what if you do not wish to enter into any kind of ceremony? Is there any level of protection available? You could enter into a cohabitation agreement. Such agreement can deal with matters such as how property will be dealt with, how bills will be paid, how debts will be addressed during your cohabitation. Most couples will have this discussion in any event when they move in together. However, this type of agreement can create a legally binding contract setting out how you will share, or not share, with your partner in the event of a separation and provides both parties with security they would not otherwise have. So do Millennials have it right? Are there more modern ways to show your commitment to another person? Are they learning from the mistakes of previous generations or suffering as a result of the divorce rates of their parents? It may be that time will only tell as to whether the balance has swung too far in the other direction from previous historic traditions. The law surrounding cohabitation and separation when you are not married can be difficult and complex to understand. Therefore, our team of specialist family solicitors are on hand to assist you. We offer 30 minutes free initial advice appointments and also offer payment plans. Please do not hesitate to contact our family solicitors Gillian Lavelle or Kim Busby if you wish to discuss any of the above further. We have a lot of enquiries as to what happens with income and assets that have been accrued after parties have separated from their spouse but prior to Divorce. Examples could include salary, bonuses, redundancy payments, inheritance or another property. The law states that all assets accrued during the marriage and indeed cohabitation (when the parties live together before they are married) form part of the ‘matrimonial pot’ and are capable of being shared. So what happens to post separation assets as technically you are still married although you are no longer in a relationship? There have been a large amount of cases through the Courts that have considered this issue. The court must determine whether there is non- matrimonial property. It is open to the court to find there is not non-matrimonial property in view of its materiality and / or relevance. If there is a “clear dividing line” between non-matrimonial property and matrimonial property then the court can apply that distinction i.e. clearly separate the assets accrued in the marriage and the assets accrued after separation. However if this is not possible the court should undertake a broad evidential assessment and leave questions of division until stage 3 (below). The court must then undertake an overall assessment of fairness with reference to the section 25 factors of the Matrimonial Causes Act 1925. It seems that if the accruals are deemed non – matrimonial and can be clearly shown that they are post separation and not relevant to the marriage that they then should not be subject to being shared with your spouse. However, in a more recent case of C v C  Roberts J stated that point 3 (above) is likely to be limited to considerations of need and compensation (as per the s25 factors). The Court will look at whether they can determine what assets have been accrued post separation and have not been mingled with matrimonial assets (i.e. assets obtained after the parties have separated). If the Court can distinguish this then the Court can draw a line to separate the assets accordingly and exclude them from the ‘matrimonial pot’. However, if it cannot be distinguished (i.e. the lines are blurred for example in a business venture that was started before the marriage which the other spouse supported) then the Court will look at the facts of each case and the assets overall to determine what will be a fair division. However, the Courts will consider need as the paramount concern i.e. whether one party has a higher need than the other for a larger share of the assets (for example due to a large difference in income, earning capacity, housing requirements etc) OR whether someone should be compensated (i.e. for a loss of pension rights due to the separation as you were relying on your spouse’s pension to support you when you reached retirement age, or you gave up your career to support your spouse’s business or to care for the children etc). Therefore, if it is found that the spouse who has not accrued the post separation assets has a need or is entitled to compensation, then the post separation accrual will not be excluded and the assets will remain in the matrimonial pot for sharing. The law surrounding financial division of assets can be difficult and complex to understand. Therefore, our team of specialist family solicitors are on hand to assist you. We offer 30 minutes free initial advice appointments and also offer payment plans. We have seen many a news story recently regarding the divorce of Ant and Lisa. Indeed, many of us, family lawyers included, have been glued to our mobile phones awaiting the next ‘breaking news’ alert. It seems that the couple are now in financial proceedings to resolve their financial matters after being granted Decree Nisi last month. The parties remain married until Decree Absolute is pronounced. The latest news is that the couple were due to attend a “preliminary hearing” so that the Court can begin analysing issues relating to the division of their assets. This is most likely to be the First Directions Appointment, the first hearing in a three-tier hearing system for the parties to resolve the issues surrounding their matrimonial finances. However, it is reported that Ant did not attend the hearing and has received a “telling off” from the Judge. The Judge is reported to have said “there isn’t one law for the famous and one for the rest of the community.” Indeed, Family Law Procedure Rule 27.3 tells us that all parties must attend a hearing of which they have been given notice, unless the Court directs otherwise. Anyone going through a similar situation should heed this warning; the Court can make any Order that they see fit during the course of the proceedings. To ensure that you have your opportunity to put forward your side to the Court, even if you are legally represented, you must attend a hearing or risk an Order being made in your absence which you may not be happy with – even if you are part of the rich and famous! If you require any advice regarding your finances following your separation / Divorce or help and assistance throughout the Court process, please contact our specialist family team on 01942 206060.